U.S. Concrete recognizes that men and women with degrees in Civil Engineering, Concrete Industry Management, Construction Management, and Business Management have a very bright future ahead, complete with many exciting job options. As a result, we do not take for granted our role in recruiting and nurturing new employees. We take a very active approach, seeking out bright, enthusiastic individuals and expose them to multiple career paths through our Professional Development Program. In addition, we are committed to bringing out the best in everyone. Our culture starts with the customer and is built upon an understanding that our people and commitment to teamwork are what set us apart. This environment is infused by our core values – to act with integrity, to adhere to strict safety practices, and to pursue excellence through innovation. We invite you to discover the opportunities offered by our company and explore the numerous career paths available to you. Our strength is the character of our people. Are you one of those special individuals who will add to our strength? U.S. 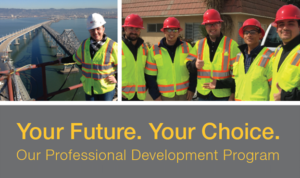 Concrete offers a comprehensive Professional Development Program designed to accelerate and broaden your learning. This program prepares you for a career, not just a job. Our Professional Development Program is tailored to provide you with on-the-job training and exposure to multiple areas of our business. You will rotate through various operations and departments, working alongside experienced managers, thereby quickly building your overall business acumen. Within this work environment, you will actively influence real-world decisions, collaborate with team members, and apply your analytical and strategic thinking to influence change and develop your skills as a leader. U.S. Concrete is recognized for staying ahead of the construction market with leading sustainable and innovative ready-mixed concrete and aggregate solutions. To achieve these goals, U.S. Concrete has an unwavering commitment to safety, research, technical excellence, and accountability with all of our customers. We are also known for our highly successful business model. Our ready-mixed and aggregate operations serve their respective markets as individually branded business units, while being supported by U.S. Concrete’s deep resources. This model promotes local entrepreneurship, so critical for today’s fast moving markets. This regionally-centric approach allows our business units to take full advantage of their long-established local reputations, extensive market knowledge, and deep customer relationships. U.S. Concrete acts as a catalyst to help our business units reach their full potential by providing strong leadership and strategic direction, essential centralized resources, robust research and development capabilities, and the financial resources necessary to support and grow their businesses.